For me When My C was a baby once he crying even know he's done eating or drinking his milk I let him put on the crib or floor sorrounding with his tons of toys to make him that he's playing with his toys he still crying I wait a minutes or it depends how bad he's face is, baby is crying but because he want mommy/daddy around with him all the time. There's an idea for that don't spoiled the baby, time well come when you do that all the time the baby cries and cries without any reason. But it helps from my parents in Law they give me a good advises which is good. It's fine Baby is crying because they want mommy cuddle all the time you don't have to do it. Need to coach your baby to roll, though just make sure she has a safe place to try it out if she wants too try to look to intertain some idea like let him play with the intertaining toys like toys with has music, books with a music and some other interesting toys in that way he won't bored. 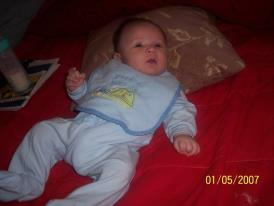 My Baby C. this is him when he is a baby time fly fast now he is 6 years old what a cutie pie I miss those time. he is a brat which is good we spoiled our baby cause they are our baby it relieves our tired after work. 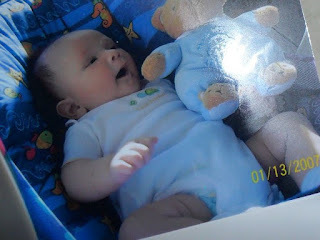 It's amazing to look back the good journey for my baby. He's my baby still. Infant can produce they called a social smile until about 8 weeks. It takes that long for his nervous system and vision to develop enough to see you and produce a smile in response. Smiling is a baby's first social skill , Like he's picking up a toy as well as a signal of emotional growth. The baby is showing you he can develop the different emotional states. He's aware that the happy feeling he gets when he sees you as a Mommy/ Daddy. Rolling over 2 or 3 months. During tummy time which you should supervise. The baby may lift herself into a push-up position and then start to rock back and forth or kick her/ his feet. Then, if she's strong enough, those movements will send her rolling over. She/ he may get start and cry the first time Flipping from back to front often takes until around 5 months because it requires more coordination and strength.